Every now and again, you come across a reference to ‘The London Stone’. Not ‘a London stone’; The London Stone. Use of the definite article tells you right away that this is Something Quite Important. Never heard of it? Tut-tut. To be honest, I worked in and around London for years and was completely unaware of it; even massive brains don’t know everything. Be aware now then, that The London Stone is a sacred object. The strange Dr John Dee, 16th century scientist, alchemist and occultist, is said to have declared that it had magic powers. Some believe that it is the stone from which the legendary King Arthur withdrew his equally legendary sword, Excalibur. It was a heathen altar, used by Druids for bloody sacrifices. The wonderful Brewer’s Dictionary of Phrase and Fable (1894 edition – every home should have one) says that the London Stone was the “central milliarium (milestone) of Roman London, similar to that in the Forum of Rome.” Jack Cade, who came from nowhere to lead a brief but violent rebellion in 1450, considered the London Stone to be a symbol of authority, making his way to it with his invading band, striking it with his sword and claiming in his alter-ego as Lord Mortimer to be ruler of the city. Even more significantly, the London Stone was the Stone of Brutus, first King of the Britons, son of Sylvius, grandson of Ascanius and great grandson of Aeneas, Trojan hero. Brutus killed his father in a hunting accident and fled to Britain with his followers, where he conquered the giants that ruled the land and established his capital, Troy-novant, or Trinovantum (‘New Troy’) on the site that became London. He brought The Stone with him from Troy and set it up as an altar in the Temple of Diana, where the ancient kings of Britain thereafter swore their oaths on it. ‘Tis said that “So long as the Stone of Brutus is safe, so long will London flourish”. Clearly, The London Stone is an object to be reckoned with. I had to track it down. After an extensive search over many years travelling strange lands, delving deep in dusty libraries, I came across an old map. You could, by searching the internet, discover more quickly that The London Stone is located at 111 Cannon Street, London EC4. In any event, I had to take a look at this thing, and took the opportunity whilst catching a train from Cannon Street Station with my daughter. Given the build-up, one could be forgiven for expecting something really impressive: a huge block of chiselled stone, glinting in the sunlight, mounted on a plinth, guarded by knights in shining armour – or, at the very least, some concrete lions and a couple of mythical beasts. Not a bit of it. 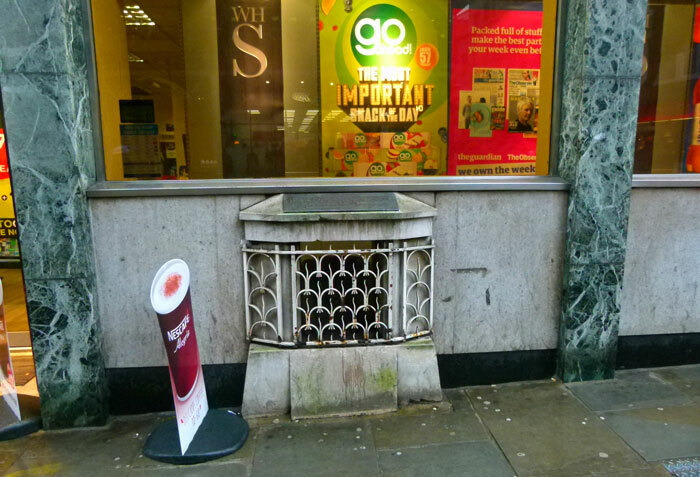 As you may already know – or have gathered – The London Stone is an extremely nondescript piece of tatty limestone. It measures just 21” x 17” x 12” (53 x 43 x 30 cms) and is located behind glass, behind a wrought-iron grill, in a niche in the bottom of a wall of a boring and tacky-looking 1960s building. 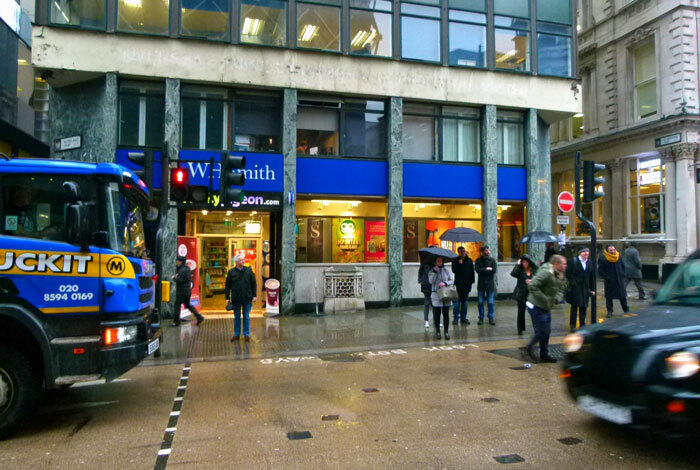 The building has been a branch of the Bank of China, a sports shop and, at the time of writing, is a branch of WH Smith. If you are in search of one of the Capital’s Great Treasures, you will be underwhelmed. Worse, London was experiencing a heavy downpour when we arrived. But I needed a photo, of course. With water dripping off my nose, focussing the camera was a problem and you can be confident that the results are not worth seeing. I was informed afterwards that passers-by gazed with some bemusement at this middle-aged slightly portly bloke standing in the pouring rain trying to focus his shaking camera on something behind a decrepit metal grill opposite Cannon Street station. See – no one knows it’s there! 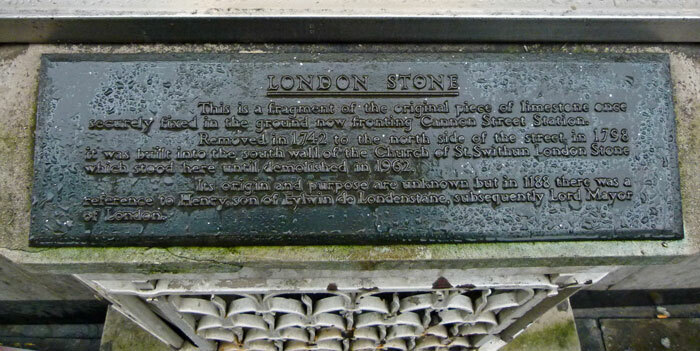 This is a fragment of the original limestone once securely fixed in the ground now fronting Cannon Street station. 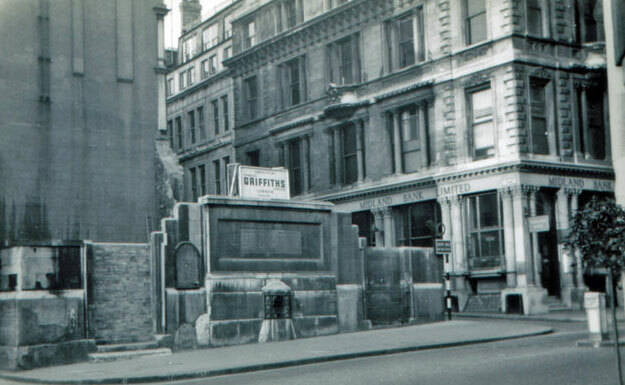 Removed in 1742 to the north side of the street, in 1798 it was built into the south wall of the Church of St Swithin London Stone which stood here until demolished in 1962. Its origin and purpose are unknown but in 1188 there was a reference to Henry, son of Eylwin de Londenstane, subsequently Lord Mayor of London. Nondescript it may be – but why would anyone go to this amount of trouble over a lump of stone? The London Stone has obviously been a feature for around 900 years, because it gave its name to a district of the 12th century city. Apparently, by the 16th century The London stone was a tourist attraction. Antiquarian John Stowe, writing in 1598, described “a great stone called London Stone, fixed in the ground very deep, fastened with bars of iron”. It was apparently damaged in the Great Fire of 1666 and moved in 1742 because it was a hazard, getting in the way of passing carts. The original St Swithin’s church was destroyed in the fire, but rebuilt by Sir Christopher Wren. The replacement was, in turn, destroyed by bombing in the Second World War and eventually demolished in 1962. I read somewhere that someone, possibly Wren, spotted stonework under the London Stone before it was moved which could have been Roman. Cannon Street (Candlewick Street in medieval times) is well inside what would have been Roman London and it is thought that the sprawling complex of the Governor’s Palace once stood where Cannon Street Station is now. Any clues in The Stone’s original location must have been obliterated during the building and excavation work. Experts say that the stone itself is oolitic limestone of a type used in Roman times – but also in the Saxon and early medieval periods. Its location is in the centre of the street grid laid out after Alfred the Great recaptured London from the Danes in 886. So, whether it had any significance before then, the stone may well have meant something to Saxon Londoners. The first reference to it actually dates to between 1098 and 1108 in a document which gives an address of an Eadwaker aet lundene stane. Jack Cade may well have felt that London Stone was an object of consequence, whether as the centre of London or something else. Relying on Shakespeare for historical fact, though, is a dodgy path to follow; his job was, after all, drama. Where the idea that it was some kind of altar stone used by Druids came from is anyone’s guess, but it seems to have been an 18th century fabrication. 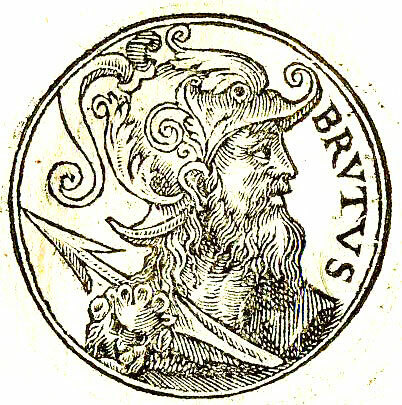 The story of Brutus comes from “The History of the Kings of Britain” (Historia Regum Britanniae), a largely mythical 12th century work written by Geoffrey of Monmouth, which is famous for its account of our lost legendary king, Arthur. Alas, it is fiction – though great propaganda. Connecting the fantasy of Brutus with the London Stone seems to have been the invention of a Welshman, Reverend Richard Williams Morgan, who in 1857 wrote a book, The British Kymry or Britons of Cambria, in which he apparently accepts the fantasy of Brutus as historical fact. And that, apparently, is where the warning proverb comes from too – “So long as the Stone of Brutus is safe, so long will London flourish”. I am sure that others have spotted that the London Stone is on a mystical ceremonial route of some sort, one of Alfred Watkins’ ley lines, or that if you dance round it seven times in an anti-clockwise direction and bend over, you’ll see the Devil. All of the stories and theories are fun, and it is difficult for us to accept that we just do not know something. But I’m afraid we are stuck with the fact that the London Stone is a mysterious stone whose “origin and purpose are unknown”. It may, of course, have had different purposes at different times. When you think about it, it is astonishing that it has survived. People have certainly gone out of their way to look after it down the centuries. The fact is that this undeniably ancient chunk of rock gained a reputation for something. We just do not know what it was. A huge amount of fuss was made in 2012 when a property developer suggested moving London Stone; it’s a safe bet that similar proposals in the future will mobilise everyone from Historic England to Nuts Anonymous.